— BugsInTheNews is a viewer-participant website. This article by Jerry Cates and Monica H., first published on 9 August 2010, was last revised on 6 July 2012. © Bugsinthenews Vol. 11:08(06). It came out of the hedge, in the air. We are in the Rio Grande Valley. I wrote back that I was very pleased to see this photo. Several years ago, someone in south Texas sent me a photo of a Ruthven’s whip snake, and somehow I lost it. Not “lost” as in really lost, like gone forever without a trace, but so submerged in the thousands of photos that I’ve received that I despair at the work involved in just finding it. Wait, the definition is the same, isn’t it? Lost. Really lost. Gone forever, without a trace. Whatever… as my grandson Jackson would say. Anyway, thanks to Monica I now have a new photo of the species to post. And this one, I swear, won’t get lost in cyberspace. At least that’s the plan. Now, let’s work the plan. Notice the somber hues on the body of this snake. 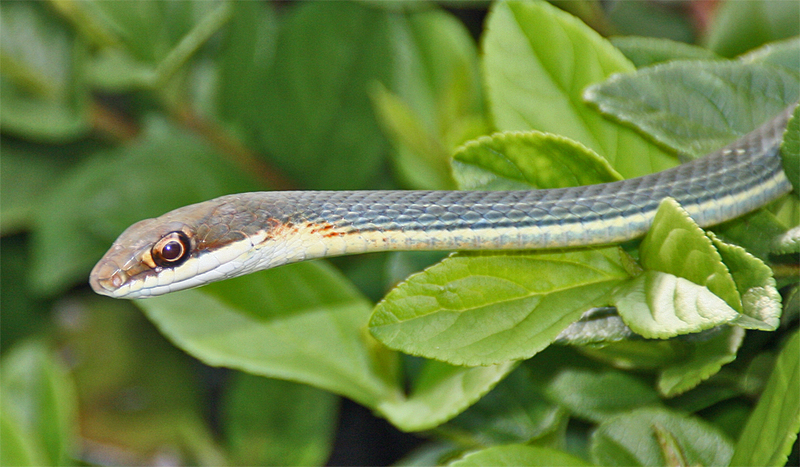 Olive gray along its spine and dorsum, two pale stripes on the side, the scales under the chin momentarily yellowish, but the yellow does not continue onto the belly (as would be the case with a yellow-bellied racer), but instead turning to a pale, mottled blue-gray just beyond the neck. This darker, blue gray marks most of the remaining belly, but not at the boundary of the belly and the sides, where the belly coloration grades to a pale white. The crown is a uniform dark olive, without any pale margins to the scales as found on some of our other whip snakes… And note the scales on the side, just back of the mouth line where the neck joins the head and the body. And notice, too, the all-important reddish orange scales that extend backward on the body from the neck. All of these features are characteristic of Ruthven’s whip snake, and most–especially the reddish orange scales at the neck–are present with Schott’s whip snake as well. In the case of Schott’s whip snake, the lateral stripes are more subdued, the coloration of the body is darker, and the junction of the belly and sides is dark, not the pale white we see here. I should point out, by the way, that distinguishing between these two very similar whip snakes is partly guesswork, especially since I’m working from the one photograph that Monica supplied, and the physical specimen is not available for closer examination. The fact that this specimen has two lateral stripes makes this serpent special. About 2/3rds of the Ruthven’s whip snakes found in the wild have but one lateral stripe. Considering that, within the U.S., Ruthven’s whip snakes are fairly rare in general, finding one with this uncommon pattern makes it even more unusual. Ruthven’s whip snake is not all that rare in Mexico. It occupies a range that stretches from Veracruz (where it is relatively plentiful) to south Texas, where it sometimes shows up in four of our Texas counties. We don’t know much about this serpent’s micro-habitat, its prey, or… well… just about any of the things we tend to know about our more common snakes. We “know” it (presumably) lays eggs. And that it (presumably) eats about the same things our other whip snakes eat. Like lizards and birds and the like. And we know this how? Because that’s what other whip snakes eat. Otherwise, the truth is we really don’t know much about this particular subspecies and its habits. Assembled and edited by Jerry Cates, Editor-in-chief, Bugsinthenews.info. Questions? Corrections? Comments? BUG ME RIGHT NOW! Telephone 512-331-1111. E-mail jerry.cates@bugsinthenews.info. Or register, log in, and leave a detailed comment in the space provided below.